It is an inspiring moment as the students of JNU fight back magnificently against a paranoid, malicious rightwing regime, bent on persecuting them through mob violence and misuse of state power. The movement against the absurd charges of ‘sedition’ foisted on student leaders and assaults on media and academics by the ruling BJP’s goons, has rallied together the entire spectrum of left, democratic parties and civil society in the country. And yet, for all the brave resistance being put up, the harsh fact remains that as far as the Indian Left is concerned, it is at its lowest ebb since Indian Independence. Over the last two decades, with their dwindling public support and confused responses to national and global developments, the left parties- across the spectrum- have become a negligible force in Indian politics. Today, talk of socialism, five year plans, public sector, anti-imperialism, Naxalism and the very idea of the Communist Party evokes little enthusiasm amidst the Indian population, including the poor and marginalized the Left is supposed to be working for. There was a time, not too long ago, when the Lefttowered mightily over domestic and foreign policy debates, shaped social and cultural trends and fired the imagination of thousands of youth across the country, willing to sacrifice their lives for the ‘revolution’. The best and brightest in the nation engaged with the philosophy of Marxism, Leninism or Maoism, left cushy careers to organize the rural and urban poor, became the finest writers, poets, artists in the nation and influenced public imagination disproportionate to their actual numbers on the ground. 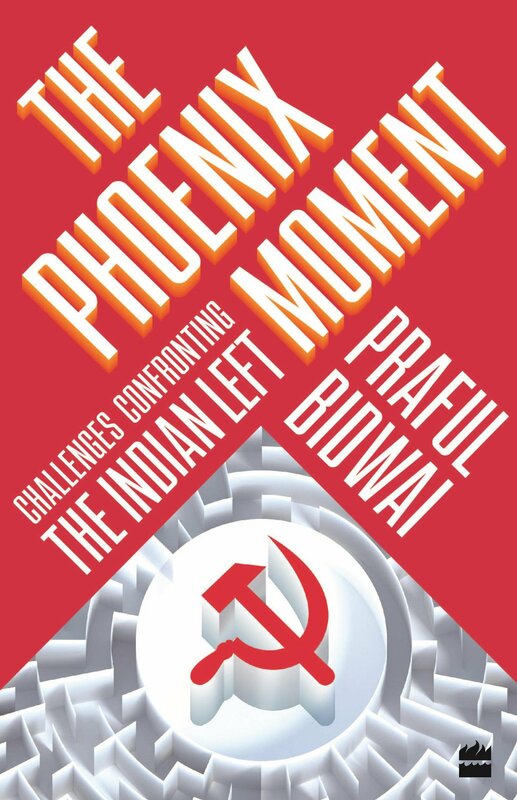 ‘The Phoenix Moment: Challenges Confronting the Indian Left’, written by the well-known journalist Praful Bidwai, is a fascinatingly detailed study of why the Indian Left both rose to dizzying heights in the past and crashed ignominiously in recent times. The last book he wrote before his untimely demise last year, it is brutally honest, meticulously researched and bitingly critical. It is also impressively broad in scope, analyzing the Left from not just the usual parameters of redistribution of wealth, public welfare and workers’ rights but also ecology, gender and caste. very embarrassing to the bosses of the bigger communist parties. They should however bear in mind it is only someone deeply anguished by the state of the left movement who could have written with so much honesty, concern and in such great detail. So, why exactly are the Indian left parties in the miserable shape they are in today? Praful traces the problems of the Indian communist movement to the time of its emergence in the thirties itself, when its leadership showed lack of theoretical clarity or willingness to creatively adapt Marxism-Leninism to the specifics of the Indian context. Instead he says, the newly formed Communist Party of India (CPI) –heavily under the influence of the Communist Party of Great Britain – ‘slavishly’ followed instructions from the Communist International and made grave political blunders. It is clear that positions taken by the CPI in the run up to Indian independence were marked by numerous flip-flops on several critical issues that showed severe confusion of priorities or even lack of sound theoretical understanding on its part. For example, though many communists and socialists were part of the Congress and the Indian freedom movement for a long time, the CPI’s decision to stay out of the Quit India movement launched by the Congress in 1942 against the British led to their alienation from the Independence struggle. The CPI, though at first internally divided on the issue, fell in line with the directive from the Communist International to support the ‘People’s War’ as the Soviet Union was under attack from Hitler and had an alliance with the British. Similarly, the CPI leadership in 1948, in an adventurist spree, dubbed Indian independence itself as ‘fake’, the Nehru government ‘illegitimate’ and called upon its cadre to revolt, with arms if needed. Following brutal suppression by the Indian state, the death or imprisonment of hundreds of its cadre and plummeting membership the party again changed track abruptly. It contested the general elections in 1952 and emerged as the main opposition to the Indian National Congress in parliament – thus giving legitimacy to a system it had condemned in the harshest terms just a few years prior. The Phoenix Moment goes on to describe how despite the lack of consistent or even coherent analysis of the Indian situation, the communist movement did grow rapidly among industrial workers, peasantry and students due to popular admiration for the Soviet Union and the dire economic conditions of post-Independence India. The CPI also had a fiercely committed cadre and many of its leaders were skilled at mobilizing and building organization. The CPI’s prestige rose further nationally when it managed to win elections to the Kerala assembly in 1957, forming the world’s first elected communist government. Its attempt at land reform however provoked a backlash from entrenched groups and the dismissal of its government by the Nehru regime again boosted the party’s image across India. Despite the split in the CPI, with the formation of the CPI (Marxist) in 1964, the movement continued to grow and achieved electoral success in West Bengal, Kerala and Tripura where the CPI(M) and its Left Front partners came to power repeatedly since the mid-seventies. In 1996, the CPM’s Jyoti Basu was even offered the post of Prime Minister as part of a coalition government, an offer rejected by his own party in what Basu called a ‘historic blunder’. More than being a mere mistake, the party’s decision probably stemmed from its deep confusion as to whether they were part of the Indian state and establishment as in real practice or carrying out a ‘revolution’ as claimed by their official rhetoric. The Phoenix Moment does an excellent job clarifying the record of all these Left Front regimes in the three states mentioned above, with detailed data on indicators such as land redistribution, literacy, health, employment, status of agricultural labour, women and minorities. While there were some very important initiatives taken on behalf of the poor and working populations and performance varies across states they ruled, the overall picture of achievements of the Left Front governments, according to Praful, was disappointing. As he points out, the left parties got entangled a bit too much in purely electoral and parliamentary politics, paying less attention to popular mobilization, building alternative institutions or political and social processes that could advance the principles of socialism in Indian society. For example, the left parties in their initial phase of rapid growth were enthusiastically involved in a wide range of popular initiatives like forming cooperatives, spreading literacy, running hospitals and clinics, battling superstition and obscurantist practices or providing relief during natural disasters. The neglect of regular organizational work by left parties was compounded by theoretical positions influenced more by experiences of the left in Europe than what was evident in the Indian context. A glaring example of this was their indifference to the issue of caste, which they treated as a ‘feudal remnant’ that would disappear with the intensification of the ‘class struggle’. This myopic stand on caste was part of a general contempt the left had for ‘identity based’ movements – like those around language, regional or community aspirations – seen to be divisive of the working classes. The fact that each Indian communist party has contributed to dividing the Indian working class by setting up their individual trade union wings – like sub-castes almost – is of course not seen as a problem of identity politics by the left leadership! The powerful emergence of the backward caste and Dalit movements in recent decades, particularly in the populous Hindi heartland, exposed the left’s lack of connect with ground realities. It did not help at all that historically, the left parties have been led overwhelmingly by those from upper caste Hindu backgrounds, with hardly any Dalits, extreme backward castes, Adivasis or Muslims anywhere in the top echelons of the organizational hierarchy. On the economic front too, while the Left organized a section of urban, industrial workers the fact remains that trade unions represent just around 7% of the close to 500 million working population in the country. The vast majority, in the informal economy with no minimum wages, harsh working conditions and little security have not figured very much on the Left’s agenda. More than half of these workers in the informal sector again are farm labour, a section the Left has neglected, focusing instead on organizing the numerically smaller but socially more powerful middle and rich peasantry. As if all this was not bad enough the Left Front regime in West Bengal lost its ideological moorings too, when it went to the extent of championing the policies of economic liberalization and privatization, introduced under pressure from Indian and foreign corporations, by the Narasimha Rao led Congress government in 1991. The Buddhadeb Bhattacharya regime’s attempt, to forcibly take away land from farmers in Singur and Nandigram on behalf of private industry in 2007, led to massive public protests that finally ousted the Left Front government itself, after being in power for over three decades continuously. It is a pity that Praful’s book does not go sufficiently into analyzing the reasons for the failure of the Indian Left to expand beyond West Bengal and Kerala or hold on to its initial strengths in states like Tamil Nadu and Andhra Pradesh. He also does not discuss the Naxalite and Maoist movements, without whose contributions as well as follies the overall Indian left movement cannot be fully understood. There is a precious section though in the appendix of the book though that gives a fascinating account of how the left built its organization and power base in Tripura, a history that is still very relevant to the future of the Indian left movement. So given all these problems in their theory and practice what are the chances of the CPI and CPM really reinventing themselves and rising from the ashes? According to Praful, this is certainly possible provided they undergo critical introspection and radical course correction, failing which they will only fade away into complete irrelevance. Unfortunately, honest reflection is unlikely given that Indian communist parties, like their counterparts internationally, have never really allowed much debate or criticism of policies within their own fold. They have instead claimed to be adhering to the Leninist principle of ‘democratic centralism’, under which factions of any kind were not allowed within the party for fear of breaking up their ‘unity’. Strangely, a movement that swore it was fighting for ‘scientific socialism’ has never really adhered to the primary processes that drive the sciences – namely free flow of ideas, debate and the right to experiment and hold dissenting positions. The price they have paid for such a rigid and foolish attitude has been high. Apart from an inability to make accurate judgments of political scenarios, the Indian Left was also not able to make course corrections because the feedback from its own cadre or leaders was censored or stifled. The brightest minds and many sincere workers of these parties got disillusioned and left, leading to a depletion of quality cadre. This in turn led to further decline of the Party’s performance, both in terms of mass mobilization and electoral performance. While Praful is deeply critical of the bigger Indian left parties for their various failures, he remains very hopeful, in general, about the future of the broader left movement, that includes other smaller communist parties and the sizeable non-party left and civil society forces. In this context, with some reservations, he also mentions the Aam Aadmi Party, whose ability to mobilise the public and focus on specific needs of the underclass bear both studying and emulation. The task of taking left principles, ideas and agendas forward according to him will fall on the shoulders of these other forces, that will need to work together in ‘shared solidarity’. As a beginning towards this, he suggests the drawing up of a ‘People’s Charter’, through a process of deep reflection and analysis, to work out a plan of transformational action in the Indian context. This is an important idea that should be considered by all those on the left at this juncture in Indian politics as a small but significant step out of the morass they are in. Having a good plan though may not be enough to take on the challenge of fighting both growing corporate power and the religious nationalism allied with it. Given the dire political situation in the country, those on the left will also have to learn how to work together eschewing narrow sectarian attitudes. It is only a popular united front of workers, farmers, students, Dalits, Adivasis and minorities, against crony capitalism and religious nationalism, that could both save Indian democracy and help the Indian left regenerate like the mythical Phoenix. The Indian left, across the spectrum, should also intensify debates within their fold on critical political, social and cultural questions. Most importantly they should ‘go back to the masses’ not only in order to regain their influence on the Indian polity but even survive as a political formation in this country.